Fly Fishing Connecticut's guide Jeff Yates has been fishing the waters of Fairfield County for 20 years. A fourth generation Wilton resident, his intimate knowledge of the Norwalk, Mianus, Saugatuck and Mill Rivers in lower Fairfield County provide the most productive outings on local waters. He has also discovered the secret streams throughout the region for targeting native brook trout, and can guide clients to a successful day of fishing for these native New England gems. 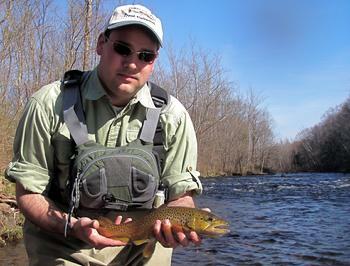 On the Farmington River, Jeff's extensive knowledge of the entire river system means clients will be able to avoid the crowds and target trophy trout no matter the season or stream flow. Summers spent fishing the streams of Vermont, hundreds of hours on the waters of Long Island Sound and years of angling for Atlantic Salmon in the Naugatuck River means clients have a range of options to choose from. A master guide and fly tyer, Jeff's goal is for his clients to learn the access points and techniques that will make them successful anglers on their own future outings. Guiding sessions are catch-and-release only and include lessons on insect entomology, stream flows and conditions, reading the water, improving casting skills and conservation and history. President of the Mianus Chapter of Trout Unlimited, board member of Friends of Mianus River Park, life member of Trout Unlimited and the Housatonic Fly Fishers Association, Jeff is also a member of the American Museum of Fly Fishing and the Catskills Fly Fishing Center and Museum. When he's not guiding or fishing, Jeff is leading river restoration projects or planning fishing and conservation events and clinics.